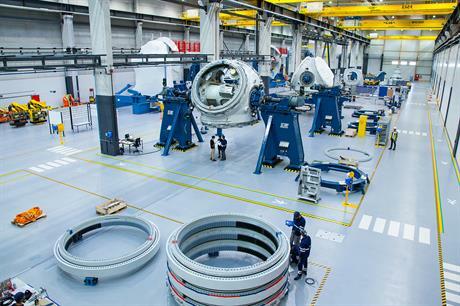 FRANCE: GE Renewable Energy plans to invest €46 million ($57 million) upgrading its factory at Saint-Nazaire in preparation for manufacturing its Haliade-X 12MW offshore turbine. The money will be invested over the next two-to-five years to adapt the assembly line, a GE spokesman explained. The factory is currently making the final Haliade 6MW nacelles for the 396MW Merkur project. Once those are finished, GE expects to start work in October on two Haliade-X prototypes. One nacelle will be sent to Blyth "to be tortured" for a year of indoor testing, the spokesman said. The other will be a complete turbine, which GE plans to install at a test site by next summer. Cherbourg is one of the contenders, but the company is considering a number of locations and hopes to make an announcement by the end of the year. If all goes to plan, the Haliade-X should receive its type certification in 2020 and start serial production and ship the first units by 2021. In the meantime, after the two 12MW prototypes are delivered, the St-Nazaire factory should start work on the 238 Haliade 6MW machines destined for the three French offshore projects (St-Nazaire, Fécamp and Courseulles-sur-Mer) awarded to an EDF Energies Nouvelles-led consortium. However, the projects are still waiting to receive their permits free of appeals and have already suffered delays. The factory can handle both turbines, though the assembly line "will probably need expanding a bit," the spokesman said. GE is considering various options. At the same time, blade manufacturer LM Wind Power — acquired by GE in 2016 — should finish building its Cherbourg factory by November and start production early next year. It will begin by making a set of 107m-long blades for the Haliade-X prototype and should then move on to blades for the three French offshore projects, alongside any orders received from other turbine manufacturers, the spokesman added.